On Saturday the 15th of July 2017, Inspirited Minds held its first Mental Health Training Programme with Imams. It was something we had been planning for many a month and something we knew could potentially be incredibly influential for our long term dream of trying to build a society where those experiencing mental health challenges receive understanding, recognition and are empowered to live fulfilling lives. Mental health illnesses are a thing. They exist. One in four people in the UK will experience a mental illness and this proportion is higher if you are from a minority group. There are a multitude of factors which may cause this within Muslim communities, some of which include: misconceptions about mental health and Islam (the most common being Muslims can not have mental health problems and if they do, they are due to a lack of faith and are a punishment from God); the increased stigma, stereotypes and prejudices we put on ourselves; the identity issues exacerbated by misrepresentation, discrimination and isolation; and the irony that so many of us pursue careers in the fields of health and medicine yet there is a lack of faith and culturally sensitive support services available for mental health. If you’re not affected by a mental health problem, a close friend or loved one may be, and if you don’t know anyone with a mental health problem it’s probably because they haven’t told you since there is so much social stigma attached to it. Oftentimes those struggling with a mental illness find it more difficult dealing with the stigma than dealing with the actual illness itself. Sadly, when someone breaks their arm everyone runs to sign the cast, yet when someone says they have a mental health problem everyone runs the other way, and so nobody sees their pain, nobody hears about their pain and ultimately nobody feels their pain. As a community it is our responsibility and obligation to change this. Imams play a pivotal role in our religious and spiritual growth and often take on additional roles within the Muslim community, they perform marriages, mediate between disputes and are regularly the first people we go to for advice and guidance. Many Imams had reached out to us to inform us they felt ill-equipped to give advice on mental health problems that they were frequently approached with. Therefore, in collaboration with Mind (the UK’s largest mental health charity) we decided to pilot a 3-day Mental Health Training Programme which would balance the professional and spiritual perspective and engage, educate and empower Imams in their roles within the community. We were humbled to have 15 Imams who had come from all across the UK, from Leicester to Bangor in Wales attend the training in London. Dr Kiran Nijabat, a Psychiatrist and Trustee for Muslim Youth Helpline began the training by providing an overview of mental health, discussed common signs and symptoms of different types of mental illnesses, depression, anxiety, schizophrenia, addictions, self-harm, suicidal thoughts, Mental Health First Aid, helping others, self help and the concept of jinn. This was followed by Sultan Hatab from our Outreach Team and medical student at King’s College London, sharing stories from the Qur’an of the trials and his tribulations faced by the prophets of God, case studies he came across whilst providing support to students at university and his own very personal experiences with depression and anxiety. The following day Aaliyah Shaikh a Psychotherapeutic Counsellor from our Support Team and founder of Rahmah Wellbeing covered the early origins of mental health depression, anxiety and trauma; the physical manifestation of symptoms and the importance of health, wellbeing, empathy and not being judgemental, along with some case study role play where Imams put themselves in the shoes of someone asking for help and someone offering help. Shaykh Shahnawaz Haque a Psychotherapist and Imam followed by presenting his model of an Islamic-based approach to mental health and illness which has evolved from the psychotherapeutic work he has been doing within the Muslim community over the last 20+ years which included an understanding of how and why Islamic principles and practices can be deeply therapeutic to people suffering from psychological and emotional problems. Ezra Hewing, Head of Mental Health Education at Suffolk Mind completed the third day of the training by providing an insight into “The Qur’an & Emotional Health: An Introduction” a unique and accessible resource, designed by Mind to meet the emotional health and mental wellbeing needs of Muslims. Following precedents established in the Qur’an, the resource has been co-produced working with Islamic scholars, psychologists and Imams and draws upon the rich heritage of Islamic psychology to meet needs in a faith and culturally sensitive manner. Providing a safe space allowed Imams to speak openly and honestly about the issues they face, discuss, debate, ask questions and get support in a non judgmental environment. 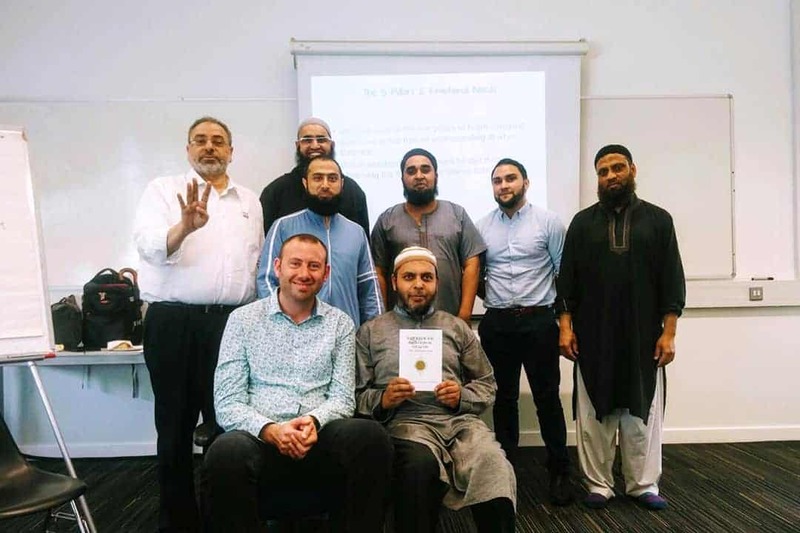 By the end of the training the Imams explained how they felt inspired and motivated to raise awareness to reduce the stigma around mental health issues and also how they now felt better equipped to support their communities. Imams are uniquely placed in that they have a platform to reach out to hundreds if not thousands of Muslims every Friday during their khutbahs (sermons), most of whom will be men, who are generally harder to reach and less likely to talk about their issues. As part of the training we wanted Imams to feel confident in giving khutbahs on mental health. One of the incredible unexpected outcomes of the training was the Imams decided to set up a whatsapp group to continue the discussion; share relevant articles, resources and research; and even the khutbahs they gave on mental health to encourage others to also do so. You can read some of the reflections from the Imams and the speakers below. In closing, it has become clear to us that more training similar to our pilot is needed, many Muslim community leaders, organisations and University Islamic Societies across the country have requested this so we are now hard at work looking at how we can best provide this. We are still a small voluntary organisation so if this is something you would like to get involved with or help us with, please do get in touch. The time has come for us to work together and strive to be at the forefront of tackling these issues. Whether there are hundreds or thousands of people within our spheres of influence or just a few, it will take the efforts of every single one of us, each unique and important in their own way, to create that society where those experiencing mental health challenges receive understanding, recognition and are empowered to live fulfilling lives. For to inspirit means to encourage, embolden, enliven, hearten and instill a strength of purpose and this is what we must now do. I thought the way in which the event was structured and organised was very good and I think the liaison between Imams and mental health professionals is essential in improving mental wellness within the Muslim community and Inspirited Minds facilitated this well. 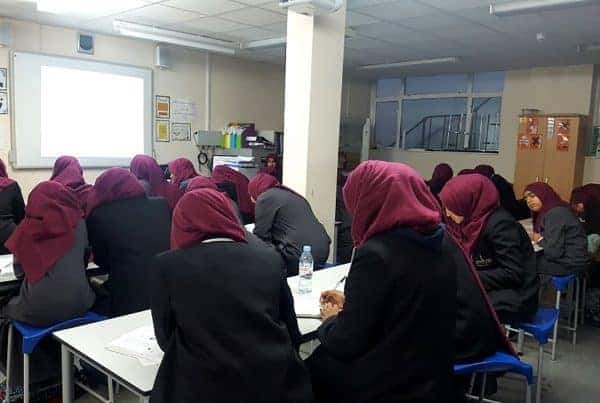 The main aim that I had with regards to the Imam training, was to inspire, educate, and empower community leaders in order to provide a service to the wider Muslim community. Being able to deliver a talk and workshop with such people was an honour. It is evident from the response that I received that Imams are looking for as much help as they can get. 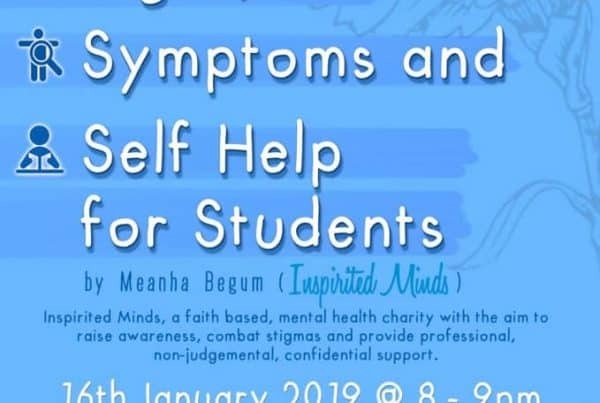 Inspirited Minds are doing excellent work to destigmatise mental health and remove the dichotomy between mental health and Islam. Hopefully the training will progress and we can develop our community leaders to work side by side with mental health professionals. I was pleased to deliver a workshop to Imams especially as I had previously worked with Imams as a chaplain and was familiar with the dynamic and issues often experienced in the community. The opportunity for us to sit together and discuss mental health which is so erroneously misunderstood was a blessing and enlightening to see so many Imams whom in some cases having little to no background knowledge of mental health were so open and humble with learning and keen to absorb information and having an open mind to incorporate different ways of thinking on some taboo and controversial issues with respect. It felt like a small but powerful breakthrough. I was impressed to hear that subsequently some of the Imams then used the information and knowledge gained through all the workshops and relayed some of that through khutbas on mental health awareness which is an incredible platform for outreach. I look forward to delivering another round of training and meeting more Imams and sharing and discussing more on these important topics. By bringing Imams together to talk about how they can take a lead role in promoting mental health Inspirited Minds have achieved something really important. I was happy and honoured to be invited to take part, and I hope that in time the rich heritage of Islamic psychology becomes accessible to members of Muslim communities in the UK, both for lay people and professionals alike. Firstly let me thank Allah swt for allowing me to attend this blessed course which discussed the important topic of the rooh and psychological health issues. Also let me congratulate you all at Inspirited Minds for your efforts and we ask Allah swt to reward you in this world and especially in the hearafter. As we mentioned at the end of the course, the 3 day program was indeed intense but very informative and beneficial for us Imams, as the needs and demands of the Muslim community in the UK are increasingly evolving- especially in issues relating to the mind. As an Imam and a member of the community we should focus on the misunderstandings within the society where those who are suffering with any mental illnesses feel that the only cure is spiritual healing and medicine is not required. People sometimes relate any aspects of mental illnesses to jinn possession and want to rely solely on spiritual healing but people need to know that taking medication is not contrary to the spiritual treatment or to the core belief of Islam. In addition, mental illness and physical illness are both illnesses. The community need to treat and respect it as an illness in order for the stigma of mental illnesses to be overcome. Thank you very much for organising such a uniquely beneficial course. It was very inspiring indeed to see young professionals like you catering for such a fundamental aspect of our Deen which no Imaam can survive without. My perception and interest in Psychology has totally changed and Insha Allah I will try to help as much as I can in linking Quranic realities with mental health and wellbeing so that we can help Allah’s creation recognise the Creator. 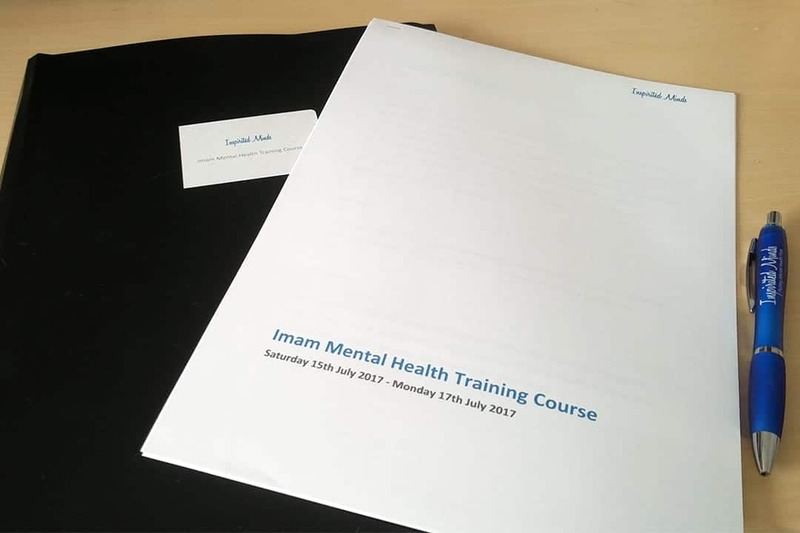 The three day Imams Mental Health Training Course, organised recently by Inspirited Minds was a unique experience, which I have not seen anyone else cover in so much detail. 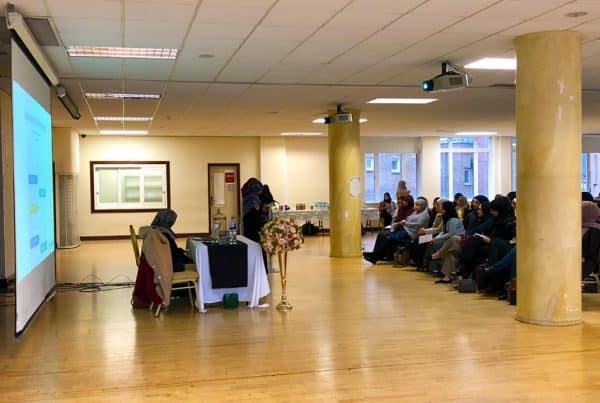 This course contextualised Islam with mental health issues and connected mental with the principles of our Deen. I think this is an important first step, which should also be offered to University Chaplains, who are connecting with Muslim students up and down the country. Currently there are approximately 100,000 Muslim students at University across Great Britain, which puts Muslim Chaplains in a very unique position of offering help and support to the next generation of Muslims. I would like to say thank you for your incredible hospitality. Throughout the training, all considerations were made to make everyone with various backgrounds feel welcomed and for this I am very grateful. I am so humbled by the work your organization is doing in trying to build an awareness for mental health and ultimately removing the negative stigma surrounding it. I can only pray that there will be more people who are dedicated to this cause, as it is an important issue silently affecting many. Please accept my thanks once more for your efforts in putting together this wonderful programme. I am truly inspired by it and will use this motivation to good effect inshaAllah. For Imams to fully understand the holistic nature of their responsibilities, it’s imperative for them to take part in basic mental health training. I would also go as far as saying that educational organisations and particularly, islamic seminaries should be promoting the advanced studies of mental health alongside the study of religion. I would like to thank Inspirited Minds for organising this unique and wonderful course for Imams. As leaders of the community we need to know and be trained in issues facing the community so we can fulfill our roles better. Mental health problems are at a rise in society, particularly stress, and this is reflected in the Muslim community too. This is very often ignored or attributed to supernatural elements such as Jinns and the problems are left unresolved. So Inspirited Minds play a vital role in providing a faith-faith solution to Muslims facing mental health problems. Over the course of three days we were able to learn about various mental health conditions, how to recognise the symptoms and how to use faith-based CBT to help individuals to minimise or overcome their problems and make referrals where necessary. During the course we not only got to learn from expert practitioners but also exchanged ideas with fellow Imams from all over the UK coming from places such as Bangor, Oldham and Luton. Thank you again for organising the wonderful course. I found the course extremely beneficial and very much needed for Ulama/Imams and Khateebs. As this is a taboo subject, the aforementioned can do a massive service in breaking the stereotype and providing hope and guidance to their congregations/communities. This is indeed a much needed khidmah. This course you arranged, was very informative and relevant to what we face/come across on almost a daily basis. Having been through this process of health myself, I appreciate the need to help others more and more, especially with the better insight you provided. Our mentality needs to comprehend this illness with the symptoms we have. Imams need to hold regular workshops in the mosques, targeting 1 symptom/illness each time. This is also much needed with the Imams who work in prisons. When we hear this information by respected and learned people, there is a better chance we would pay attention and seek help more often as a community. Jazak Allah khyran for inviting me to this course. I believe it is very important for Imams to attend courses on mental health. There must be more focus on the heart and the soul and how to nourish them in a way that makes a Muslim avoid depression. As Imam’s we have daily occurrences with individuals who suffer from mental health illnesses and, unfortunately we find there is a social stigma surrounding them, and in many cases they are referred to as being possessed. Thanks to Inspirited Minds and their gesture of kindness for hosting the Imam’s mental health training, I feel better educated & equipped in relation to mental health issues, I also feel a sense of responsibility for the need to create awareness around the whole social stigma aspect and to connect those who need support to the relevant resources available. I would encourage Inspirited Minds to continue supporting Imams with relevant trainings and would definitely encourage the Imams who are at the forefront with their communities to participate when these opportunities arise. May Allah the Almighty help you in all your future endeavours Ameen. Next PostReaching out for help? Good evening, Can you please share the issues discussed? Which issues cropped up during discussions? The article mentions stigma but this was expected and no community is free from stigma. However were there any unexpected findings and was there any more information you can provide?